I'm fairly certain Bonk will forever be known as the character that ended up with the bronze medal in the great gaming mascot wars of the 90s. 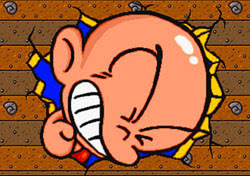 Bonk had a lot going for him--he was cute, knew how to use his head (bad pun, I know) and never buckled under pressure (even when that pressure came from immense green dinosaurs)--but just couldn't overcome the one-two punch of Nintendo's Mario and Sega's Sonic. So while Super Mario World and Sonic the Hedgehog helped sell millions upon millions of Super NES and Genesis systems during the 16-bit era, Bonk struggled a bit to hock NEC's doomed-from-the-start TurboGrafx-16 system. That's too bad, because Bonk's Adventure was an enjoyable little platformer. It didn't offer the speed of Sonic or the depth of Mario, but it was a fun and fairly unique experience nonetheless. Now that the game has been released for the Wii's Virtual Console, a new generation of gamers have been given the chance to experience Bonk and his cromagnon quest. Is it worth your hard-earned Wii points? If you're a fan of 2D action/platform games, I'd say the answer is a definite "yes." If your idea of fun is blasting through 3D environments and nothing else, well, you may want to pass this one by. Bonk's Adventure goes by at a fairly leisurely pace. You basically move Bonk through various BC-inspired landscapes while taking out enemies (mostly dinosaurs and such) with your big noggin. In that regard, Bonk can headbutt his foes or jump into the air and dive bomb them. Another move at his disposal is to jump into the air and spin wildly--which effectively lets him fly or float for a bit to cross chasms and such. That's really all there is to it. It's like Mario transported back a few millennia. And aside from the headbutting, that's where Bonk's charms lie: the landscapes are colorful, cute and fun--all of which aptly describe his friends and foes as well. The music and sound effects are a bit on the "blip" and "bloop" side of things, but even they fit the bill and are never grating or annoying. If you have a few Wii points burning a hole in your virtual pocket--and are longing for a bit of old school platforming action--you could do much worse than download Bonk's Adventure. Keep an eye out, too, for the sequel, Bonk's Revenge, and the Bonk-themed shooter, Air Zonk. Both provide similarly unique thrills for those interested in the genre.